It seemed like a great idea at the time I signed up for this five-kilometer race. It would be an excellent way to start off the new year on the right foot. 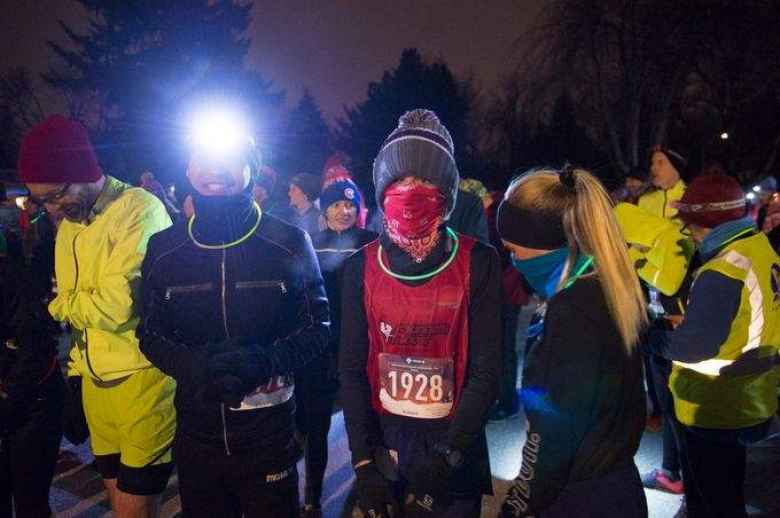 There was also the novelty of both starting and finishing a race for the first time during nighttime, and the extra incentive of winning “a special prize” for finishing in a time under 20:19. 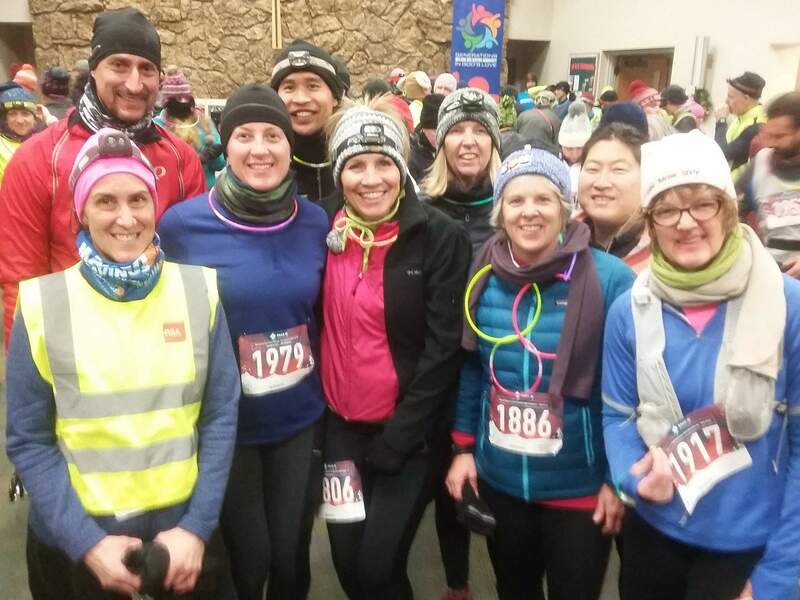 But if I had any illusion that this could be a fast race, that went out the window by race time when it was clear the temperature was not going to exceed 13 degrees Fahrenheit. Plus, it was snowing. All of this necessitated wearing enough insulation to make one feel as restricted as the little boy in The Christmas Story who was so overdressed by his mother that he could not fully lower his arms. In my case, I wore my favorite black jacket, a long sleeved shirt, gym pants, two pairs of gloves, two pairs of socks, and a fleece hat with integrated face mask that is nearly suitable for robbing convenience stores. Oh, and a headlamp and glow sticks. The latter were thoughtfully provided by the Fort Collins Running Club, which acquired ownership of the race only a couple months before from a different organization that had been running the annual race for at least a couple decades. I was off like a bat the moment the start countdown concluded. First place for the first 50 meters! Of course, then I was passed by more than a dozen speedier folks, which was fine by me as I really didn’t know where I was going. Neither did the volunteer bicycle pacer, it seemed. At least, after the first 100 meters, the cyclist turned right but the volunteers had directed the runners to go left! Navigation was an issue in this race. After the first mile, the Garmin read that 6:35 had elapsed. That surprised me since I felt like I was going slower. Around this point, my friend Jen sped by. That was not a surprise because she is fast and has beaten me in every race we’ve done together. Unfortunately, after that my pace slowed to over seven minutes per mile. I felt like I couldn’t get into a good rhythm and was overheating. To mitigate the latter, I unzipped the jacket halfway, but shortly after it auto-unzipped entirely and was flapping in the wind. That was distracting, and so was trying to re-zip it. With snow on the ground and clouds obscuring any potential starlight or moonlight, it also was hard to see where sidewalks were located. 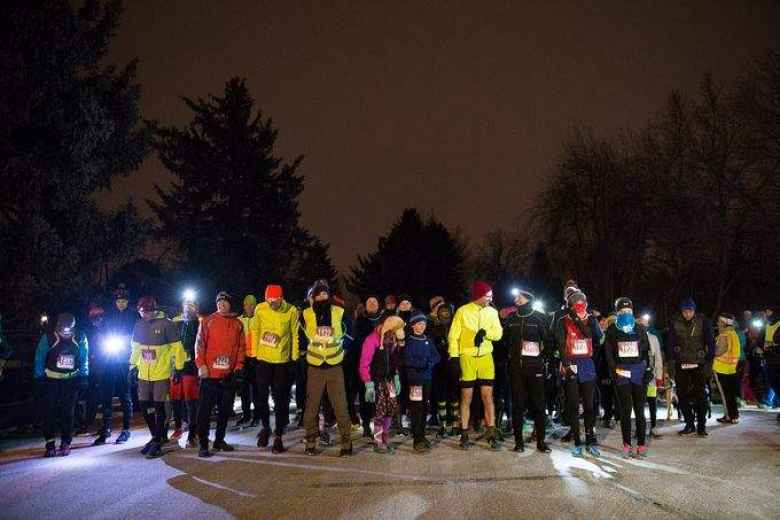 Therefore, I tended to run along the tire tracks carved into the snow or follow behind other runners instead of taking the shortest line. Not long after Mile 2 I had already conceded that I’d be lucky to finish under 22 minutes. But wait! A couple other runners who had already finished the race were walking back toward the course, and there was a turn up ahead. It felt like the finish was very close. Indeed, when I rounded the corner, I saw the finishing banner maybe 100 meters away—almost too late to sprint especially since there was another sharp and slick bend to run around. My terminal velocity was a mere 6:19/mile, confirming that I never was able to fully turn on the afterburners into the finishing chute. The Garmin did confirm, however, the course was a half-mile short. Just as well as I wasn’t feeling so hot and was actually kind of glad I didn’t have to go the full distance. A nice side effect was finishing under 20:19 due to the shorter length. Happy 2019, everyone.